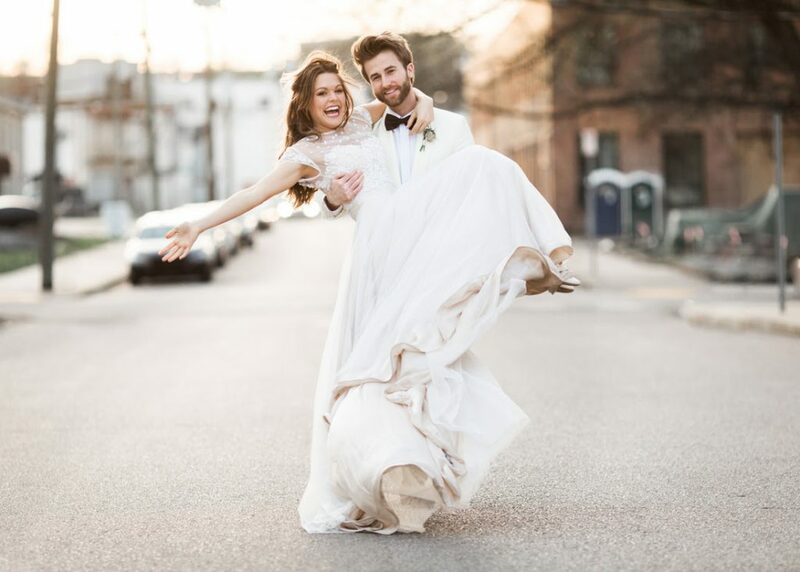 As previously reported by The Tennessean, Colton Swon and Caroline Glaser were married Saturday evening March 17th at 5:30 pm surrounded by a host of family and close friends. The ceremony was held at the historic Houston Station in Nashville, TN. The beautiful brick walls and old hardwood floors were the perfect setting for the couple’s celebration. After saying their vows in a simple and beautiful exchange, the couple retreated for photos while their guests were welcomed to a pre-dinner reception. Zach Swon, who stood by his brother’s side, served as Best Man and gave a toast during dinner that would rival any. His heartwarming comments even got the best of him as he choked up during his speech, but not before he cracked a sibling joke or two, like only he can. The evening was topped off with dancing, and of course, live music. The wedding was not the only occasion being celebrated on Saturday, in addition to being St. Patrick’s Day, it was also the bride’s birthday and her groom surprised her with a Fender Jazzmaster electric guitar. To add to the entertainment, Colton and Caroline, in true musician fashion, also had a special room set aside with an open stage pre-set with instruments and gear and invited all of their musical buddies to step up to play free-form style. The jam was spectacular! Caroline was stunning in a wedding dress, designed by renowned Russian-born, Nashville-based designer, Olia Zavozina, which showcased a beaded bolero top and an added a removable train skirt to her tea length gown. Colton’s tuxedo was also a Zavozina creation, as was Zach’s tux and their mother’s gown. The couple departed the event in a Prevost “chariot,” courtesy of Cowboy Cadillac. Colton and Caroline first met as contestants on Season 4 of NBC’s “The Voice” and have been inseparable ever since. Caroline is a notable solo Indie Rock artist and writer who is about to release brand new music. The Swon Brothers have a self-penned new single out right now, called “What Ever Happened,” which was released on February 23rd and is streaming on Pandora, Apple Music and Spotify’s “Wild Country” and “New Boots” and ONErpm’s “Backroads Country” Playlists. A honeymoon is planned for a future date, as both artists are currently working on new music.